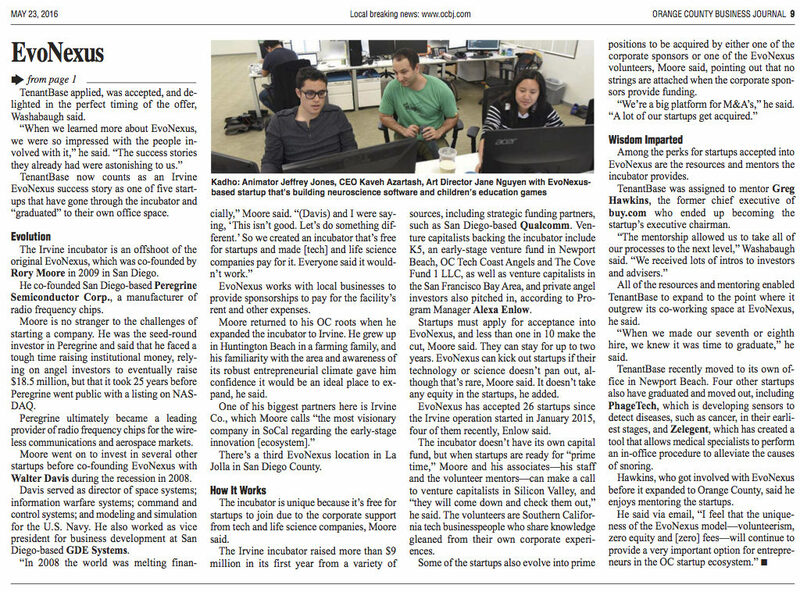 Did you catch the EvoNexus article, "Incubator Unique Add to Startup Ecosystem," in the OC Business Journal yesterday? 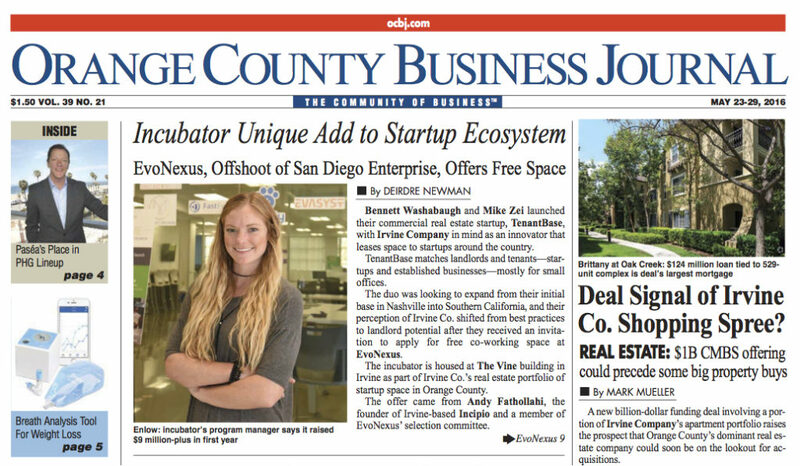 We were thrilled to be featured in the piece which included TenantBase’s recent graduation from Irvine business incubator EvoNexus to new headquarters in Newport Beach, CA. Our mission at TenantBase is to make searching for an office and signing a lease simple for startups and small businesses. We believe searching for online office space should be simple and fun experience, while saving our clients time and money. We provide the online tools and personal support small businesses and startups need to find their dream office (on their own time). This is the mission co-founders Bennett Washabaugh, Mike Zei, and Andy Kish have had since TenantBase’s beginning in Nashville. Once TenantBase decided to expand to Southern California, we received an invitation from Andy Fathollahi, Irvine based Incipio founder and EvoNexus selection committee member, to apply for one of EvoNexus’ free co-working spaces. According to EvoNexus founder Rory Moore, the EvoNexus incubator is supported by tech and life science companies, which allows the program to be free of cost for startups. In fact, companies such as San Diego based QualComm have raised more than $9 million for the incubator in its first year. Although the space is free, the competition is tough. Less than one in ten startups is accepted after applying, and EvoNexus remains exclusive; only 26 startups have been invited since 2015. These selected startups receive resources and mentors that help them to grow their business. Former chief executive of Buy.com Greg Hawkins was assigned to TenantBase as a mentor. He helped introduce TenantBase to investors and advisors and eventually became TenantBase’s Executive Chairman. Due to the support, advice, and strategic networking provided by ExoNexus, TenantBase was able to grow quickly, graduate from the wonderful EvoNexus program, and move to its current Orange County location. Thank you to OC Business Journal for our feature!